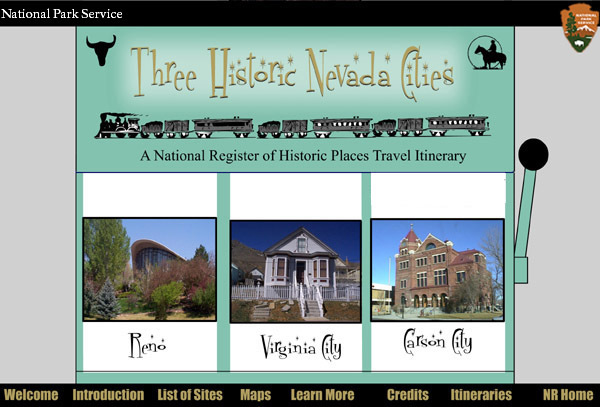 This is a static version of the Three Historic Nevada Cities: Carson City, Reno, Virginia City Travel Itinerary Homepage. You can view the flash version of this page. Produced by the National Park Service's National Register of Historic Places and the Nevada State Historic Preservation Office, in partnership with the Historic Reno Preservation Society, Reno Historical Resources Commission, City of Reno, Comstock Historic District Commission, Carson City Planning and Community Development, Carson City Historic Review Commission and the National Conference of State Historic Preservation Officers.